Penelope Bloom has been on my mind again, along with her beloved toy bunny, reminding me of the purity and innocence of childhood. 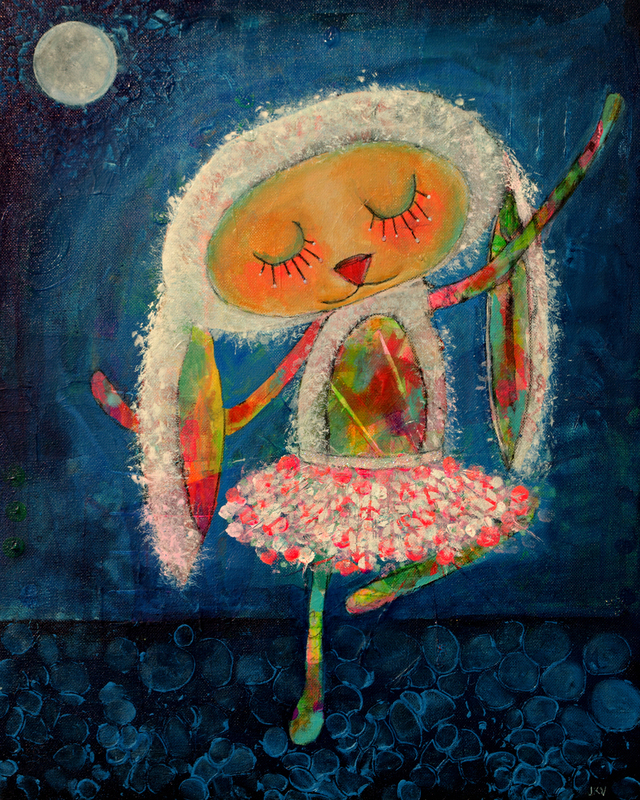 For a brief moment, I saw a Penelope Bloom bunny come to life, dancing in the light of the moon, free of everything that would weigh her down as she moved without constraints. Perhaps someday we will do the same. I painted this on a 16 x 20 inch canvas using Daler Rowney Acrylic Inks, Stabilo Pencils, Golden Acrylic Heavy Body and Open paints, Ephemera, Pan Pastels, Oil Pastels, and Winsor Newton Artist Oil bars. My favorite part is the glitter paint on the eyelashes!